The Special Purpose Award in Effective Teaching in Higher Education is to recognise and reward high quality teaching and learning practices that staff have developed through their experience of designing, teaching and assessing modules. CIT staff with 5 years teaching experience in higher education who have designed modules and use technology (e.g. Blackboard/Canvas) in their teaching. CIT staff who may already have a Masters and/or PhD in their academic discipline and would like to obtain a qualification in Teaching and Learning. A professional qualification in Teaching and Learning at Level 9. An opportunity to enhance your teaching and learning practice through structured learning activities and informal discussions with colleagues. An opportunity to reflect on, and showcase your practice. The intention is that this award can be completed within a single semester. What is the structure of the programme? 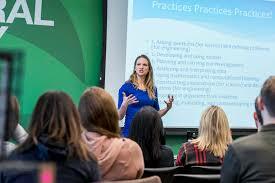 The programme consists of a single 20 credit module “Teaching Practice in Higher Education”. Please refer to https://courses.cit.ie/ for details of this module. What is the plan for delivery of the programme? The module will run subject to demand (i.e. at least 5 staff express an interest in completing the module). Informal information sessions will be held at the start of each semester so keep an eye out for notification via email, the TLU website news and what’s on sections or on social media. The Programme Coordinator is Dr. Tom O’Mahony (Tom.OMahony@cit.ie) - alternatively, you can contact us and we can forward your query.